Wink Swimwear is a tremendous find, and if you have never been in this shop, you are missing out! Now you have no excuse - visit Wink on your next trip and online! Wink Swimwear in Fish Creek, in the shops behind Bayside Tavern (the Bayside Tavern Alleyway), near Malibu Moo’s, is a awesome shop and unique to Door County. Video Coming Soon! Swimwear, cover-ups, accessories like handbags, hats and flip-flops – you will find all you need or the beach, boat or pool at Wink. They even have sun-screening “rash guard” clothing for kayaking, and paddle-boarding. Our DoorCountyNavigator.com reviewers met with Deb, who has owned and operated this unique shop since 1986. 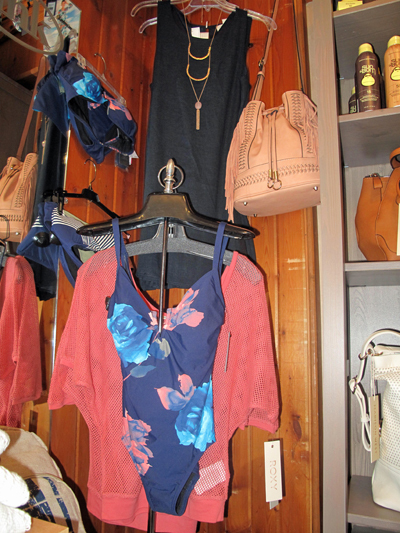 With swimwear for men, women and children in all sizes from children’s to 24W – you will find it all right here, in this cozy cottage shop in Fish Creek. You will also find wonderful resort wear, dresses, handbags, accessories, flip-flops, and a whole lot more. And a staff that is there to help you find exactly what you need. If you like swimwear and the summer life, head into Wink for a wonderful experience, top lines, and tremendous service. Make Wink a definite stop on your next Door County vacation – this is the best of everything. Buy something for yourself or for a friend, or both. This is the place to be! We loved everything about this shop: location, ambiance, the lines they carry and the staff. Perfect. Come here now! And hey, remember what Ralph Waldo Emerson said: “Live in the sunshine, swim the sea, drink the wild air.” Start your adventure at Wink, and tell Deb that DoorCountyNavigator.com sent you in to see her magnificent collection.